I've been a lazy blogger this week, traveling to Chicago and prepping for Houston next week. Looking forward to rocking the single-girl life this weekend (D is in Brazil) and have wine and cheese plans for the Duke UNC game. 65 and sunny this weekend is giving me something to look forward to! 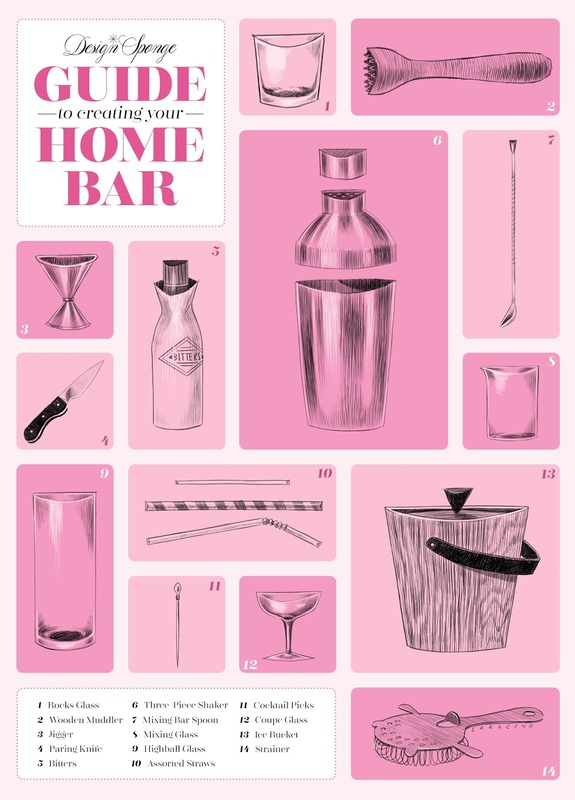 How cute is that bar essentials poster? You can download it from Design*Sponge here. Would be very sweet over a bar cart in a more girly home. A pet first aid app? If I owned a pet (don't worry, operation autumn kitty is in the planning phase) I would download this asap, from the Red Cross so you know it's good. I am all for learning speed reading, especially as I work myself through a 1,000 page book this month. Check this out for a little free training. Everyone panic: Chipotle guac is in trouble. I thought I would love speed reading - but I hate it! You learn to tune out the voice in your head that "speaks" what you read. Sounds like nothing, but it really took the fun out of reading for pleasure. Will be interested to hear your experience, though!